Perennial PPD offers a load control management program for irrigation customers. Load control management allows customers to choose a level of control that suits their needs. Reminder: All irrigation wells in the load management program are subject for up to 6 hours of control on Sundays. Sunday control applies to one day, three day and anytime control. This page is updated daily during the irrigation load control season (June – September). You can also call our Irrigation Load Control Hotline at (402) 362-4786 or tune into KRVN 880 Rural Radio for load control status. Above is the irrigation load control status for today. 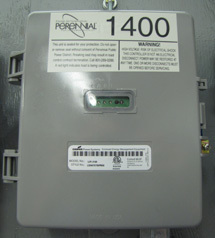 Call Perennial at (402) 362-3355 if you are planning to make efficiency changes to your irrigation system. Checkout our brochure for further details. Also checkout our Energy Wise page for these and other energy efficiency rebate programs. Perennial Public Power District, like most rural power districts in Nebraska, realizes a tremendous peak in energy use during the months of June through September. A major portion of this peak is due to crop irrigation, since wells are only used for a short period and then sit idle during the winter months. In order to keep peaks as low as possible, the District installs radio controlled switches directly on customers’ irrigation wells. At the headquarters, a system operator monitors system load and has the ability to shut wells off until a desired load level is achieved. As the system peak rises, more wells are shut off. Effective for 2013 load control season, all load control participants are subject to control on Sundays and holidays. Load control on Sundays and holidays are limited to six hours of control. The control times are determined on a daily basis by the District’s power supplier NPPD. Load Control Hot-line – If you want to know if the District is planning to control load, you can call the load control hot-line at (402) 362-4786. You will hear a prerecorded message announcing when load control will begin and end that day. We will also announce if no control is planned for the day. 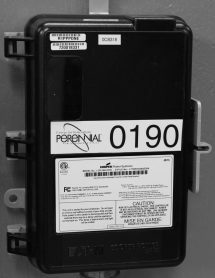 Load Control Switch – To the left is a close-up of a typical load control switch. A GREEN light in the window in the middle of the box, means that there is power to the load control switch. If you see a RED light, your well is under control and will not start. If you have a red light and you don’t think your well should be under control, first check the message at the top of this page to see if we are controlling load. If we are not controlling load, call the District at (402) 362-3355 or after hours at (402) 362-3357 or 1-800-289-0288 and report it. When calling, be sure to give the name that appears on your bill, the legal description and if possible your well number. It is also helpful to leave a telephone number where you can be reached. Making your home or business more energy efficient is one of the quickest ways to lower your energy cost and save you money. This can be achieved by improving your building envelope by sealing air leaks, replacing old doors and windows, adding insulation, or any method to lower the air infiltration on your building space. Updating your appliances is also a great way to lower your energy cost. We offer the following information and energy efficient tips to help you achieve those goals. The Home Efficiency Checklist will show you a number of easy inexpensive “do it yourself” projects that will reduce your heating and cooling costs and also make your home a healthier more comfortable place to live. Here you will find the latest technologies for your new home that meets or exceeds your expectations of how your new home will perform as a system. There are many ways you depend on electricity. As your electric supplier we’ve developed this brochure to help you determine your electric usage. We hope this will help you use your electricity as efficiently as possible. If you are concerned about your electric bill, this “do it yourself” checklist will cover some major energy consuming devices and ways to better control your electrical usage. Why has my electrical usage gone up? Here is a list of things to consider when you are concerned about higher electrical usage on your monthly bill. Determining where to plant a tree is a decision that should not be taken lightly. Many factors should be considered prior to planting. When planning what type of tree to plant, remember to look up and look down to determine where the tree will be located in relation to overhead and underground utility lines. Often we take our electric utility services for granted because they have become a part of our daily lives. For us to enjoy the convenience of reliable, uninterrupted service, electric utility companies are required to bring utilities into our homes. These services arrive at our homes through overhead and underground lines. The location of these lines should have a direct impact on your tree and planting site selection. The ultimate, mature height of a tree to be planted must be within the available overhead growing space. 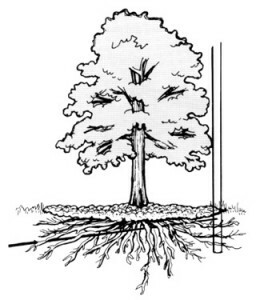 Just as importantly, the soil area must be large enough to accommodate the particular rooting habits and ultimate trunk diameter of the tree. Proper tree and sight selection will provide trouble-free beauty and pleasure for years to come. Overhead utility lines are the easiest to see and probably the ones we take most for granted. Although these lines look harmless enough, they can be extremely dangerous. Planting tall growing trees under and near these lines will ultimately require your electric utility company to prune them to maintain safe clearance from the wires. This pruning may result in the tree having an unnatural appearance. Periodic pruning can also lead to a shortened life span for the tree. Trees which must be pruned away from power lines are under greater stress and more susceptible to insects and disease. Small immature trees planted today can become problem trees in the future. 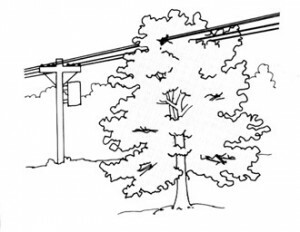 Tall growing trees near overhead lines can cause service interruptions when trees contact the wires. Children or adults climbing in these trees can be severely injured or even killed if they come in contact with the wires. Proper selection and placement of trees in and around overhead power lines can eliminate potential public safety hazards, reduce expenses for the power company and their rate payers and improve the appearance of landscapes. Trees are much more than what we see overhead. Many times the root area is larger than the branch spread above ground. Particularily in the urban areas, many of the electric lines are buried in the ground. Tree roots and underground lines often co-exist without problems. However, trees planted near underground lines could have their roots damaged if the lines need to be dug up for repairs. Consult your tree care professional or garden center staff for assistance in choosing the tree which will have the right type of root system for the location you have chosen. The biggest danger to underground lines occurs during planting. Before you plant, make sure you Call Before You Dig! Never assume that these electric lines are buried deeper than you plan to dig. In some cases electric lines can be very close to the surface. Plant deciduous (autumn leaf-dropping) trees on the south and/or west side of the house to cool in the summer and allow sun to enter the house in the winter. Planning before planting will help you to be sure that the right tree is planted in the right place. Proper tree selection and placement will enhance your property value and prevent costly maintenance trimming and damage to your home. Good landscaping utilizes shrubs and low-growing trees that are compatible with electric lines. They will not, therefore, create public safety hazards, cause service interruptions to you or your neighbors nor will they require severe pruning. Want to avoid spending a day in the dark? It’s as simple as 8-1-1. March 1990 – Numerous tornados crossed the district service area causing extensive damage. July 8, 1993 – The entire district saw damage when a major windstorm hit the service area. 11 of 13 substations were without power and the district lost 23 transmission and 100 distribution poles. Several primary and secondary lines were also damaged due to falling tree limbs. November 1994 – Rural Extra is inserted into the Rural Electric Nebraskan magazine. November 15, 1994 – High Plains Corporation ethanol plant began production. The capacity is expected to be 35 million gallons per year. December 1994 – REA out, RUS in – After 130 years, reorganization took place within the United States Department of Agriculture. REA was eliminated and RUS (Rural Utilities Services) went into place. December 1996 – Early that year the Nebraska Legislature adopted a resolution, LR455 directing the Natural Resource Committee to study the electrical industry in Nebraska and the possible effects of competition and industry restructuring. October 25, 1997 – Most of rural Fillmore County and parts of southeastern York County were in the dark after a blizzard hit the service area. Crews from Polk County PPD and Butler PPD were brought in to help. A total of 764 services were without power. The majority of customers were back on in 4 days. 1998 – District launches internet website. 1999 – Over the past year the district had been working with its power supplier Nebraska Public Power District and other wholesale and municipal customers of NPPD on a project know as “Future Strategies.” The mission of the project was to develop strategies to improve the efficiency of the electric industry in the state and to prepare for competition in a deregulated environment. There were 3 components of Future Strategies. The first involved the realignment of retail service areas and sub-transmission systems to increase operational efficiencies. Under this plan 7 towns in the district’s service area and served by NPPD Retail, were realigned to the district. Additionally the district acquired 108 miles of 34.5 kV sub-transmission line from NPPD. A second component of Future Strategies was the formation of an Energy Services Company or (ESCO). This organization provided the district, NPPD and other wholesale power districts the ability to effectively offer energy related products and services to customers. Examples of these products were surge suppression equipment, energy analysis programs, and bill payer assistance programs. January 4, 1999 – District turns 60. July 1999 – Issued statement to customers letting them know that the district had been studying the operations of the district in preparation for Year 2000 (Y2K). Y2K ended up having little if any effect on the district.